Welcome to the PRiME team Dr Ghaithaa Manla, PRiME Impact Manager. In her role as Impactech manager, Ghaithaa is currently Enterprise Research Fellow for the Faculty of Physical Sciences and Engineering. Her Role is to enhance the relationship between industry and academia to maximize the impact of research on our society and thus the economy. Ghaithaa will use her experience and expertise to help PRiME partners, industrial collaborators and associate companies to shape and provide guidance on how to explore the impact of the programme. 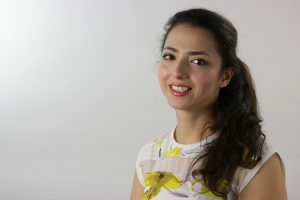 Ghaithaa did her MSc in Microelectronics at the University of Southampton before embarking on a PhD in Renewable Energy. During her PhD, she was interested in applied research and worked closely with industry. She noticed that the core interest of academia and industry differs. While, academic research focuses on creating new knowledge and excelling in existing know-how, industry concentrates on mastering the challenges of a competitive environment and are striving for market success. When they collaborate mutual advantages are achieved through transferring theoretical ideas into more practical projects and implementing the latest research results in the real world.